For the first time, Garnier Micellar technology is formulated with nourishing oils. The micelles (cleansing agents) capture impurities like a magnet & lift away dirt from the skin, whilst the oils instantly dissolve all types of make-up. Cleanse and nourish the feel of skin, in one step without rinsing. 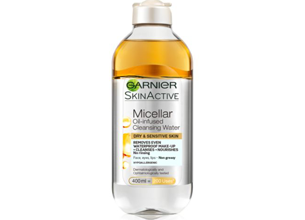 The Garnier micellar oil infused water is perfect for my dry dull skin. Especially to remove my eye makeup as I suffer from severe dark circles and I always require products that are not harsh on my eyes. I use a cotton pad and just drop a few drops of the micellar water and place it on my eyes and gently wipe off the excess makeup after using a makeup remover. The Garnier micellar oil infused water is perfect for my dry dull skin. Especially to remove my eye makeup as I suffer from severe dark circles and I always require products that are not harsh on my eyes. I use a cotton pad and just drop a few drops of the micellar water and place it on my eyes and gently wipe off the excess makeup after using a makeup remover. It is also perfect after you have cleansed your face. I have already gone through 3 of these bottles. It’s by far the best drugstore makeup remover. Very gentle on the skin especially on the eyes, it removes eye makeup easily and doesn’t dry out the area! A must have for anyone that needs to remove makeup on a daily basis as it is easy on the pocket! How did I live without this for so long? I am obsessed with makeup but I absolutely detest removing it. It takes forever as I wear full makeup every single day and I hate how it leaves my skin feeling dry and cracked… like I need to saturate it in lip balm or something. I gave this a try after hearing how happy one of my friends were and I get why. Firstly it is so affordable and lasts really long, the oil infused liquid doesn’t dry my skin out or pull and tug at it like other removers. It even works with my normal face cloth when I have run out of cotton swabs. Best of all, it is a no-rinse product which I love for traveling. I always tend to still exfoliate afterward but I have had the odd occasion where that was not possible. I give this product a thumbs up! It even gets rid of my long lasting lipsticks in one swipe! Just be sure to shake it before every use or you will use up all the oil like I did with my 1st bottle. For my always dry skin, this has become a holy grail product! My favourite from the range of micellar water. I have dry skin and the infused oil makes make skin feel moisturised and clean. This right here is the plug! It’s hassle-free and removes my makeup with ease. It has been my go-to product to remove all my makeup before cleansing. It has certainly replaced makeup wipes for me. I love the product packaging as well and the fact that Garnier has one for sensitive skin too. 5 Thumbs up for this one.